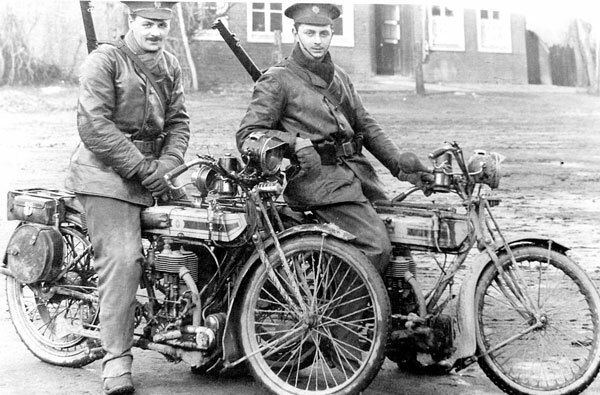 Description: Two First World War soldiers on what are believed to be Guy motorcycles. Location unknown. 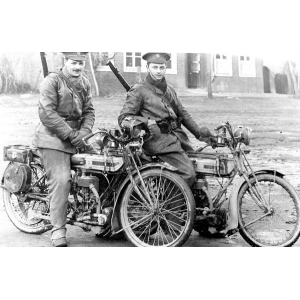 Admin History: Guy Motors Ltd. was established at Fallings Park in 1913 by Sidney Slater Guy. The factory actually opened in 1914. Originally manufacturing lorries, it turned to the production of charabancs after World War I, and in the 1920s, cars, buses and trolleybuses. It also added several other important innovations to the automotive industry in the form of a V8 petrol engine, automatic chassis lubrication, rear-hinged doors, adjustable steering columns, 6-wheel bus and trolleybus chassis, the first bus and truck available with diesel engines, 4-wheel disc brakes, and air suspension etc. Some of its customers included London Transport, Ever Ready, Harrods and Wolverhampton Corporation. In 1928 Guy's took over Star Cars Ltd continuing production of the Star car until 1932. In 1948 the company acquired Sunbeam-Karrier. With falling sales, Guy Motors Ltd ceased trading in 1961 when it was acquired by Jaguar Cars Ltd. Jaguar carried on the production as Guy Motors (Europe) Ltd which in 1964, changed its name back to Guy Motors Ltd.